Raise your hand if you talk on a smartphone. Good, good, a lot of you. Me too. Keep it up if you have a smartwatch or pedometer. OK, yeah, I see a few. 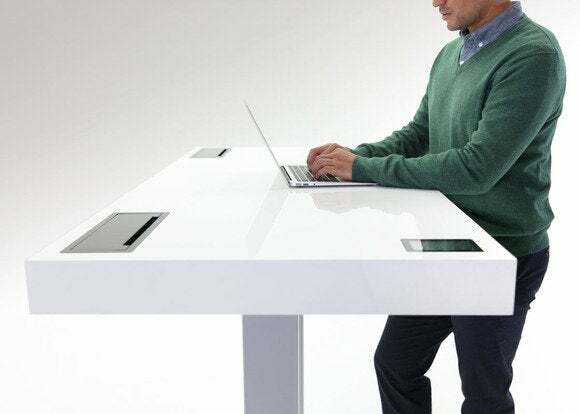 Now raise your hand if you use a smart desk all day, one that learns from your habits whether you’re rather sit or stand at any given moment, and can prompt you to switch with minimal disturbance. Well, that’s because the Kinetic Desk was just announced Thursday by Stir, a small LA-based startup. TechHive caught up with JP Labrosse, founder and CEO of Stir. Labrosse was part of the original iPod team, which operated in such secret inside Apple that he said it was like working at a startup—down to everyone setting up their workspace however they wanted, including some early adopters of the standing desk that’s enjoying its moment these days. The Kinetic Desk is the culmination of Labrosse’s fascination with the form. 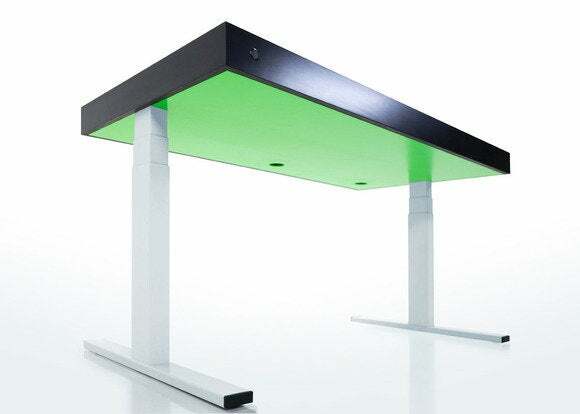 The desk looks like it’s been touched by a magic wand that makes everything resemble an iPod fresh out of the box—gleaming white, minimalist design, an embedded iPod touch-like screen in the left-hand corner just begging to be swiped and tapped. A single plug powers the built-in power strip and USB charging ports, cleverly hidden in the desk’s top corners. The compartments are even big enough to store power bricks and excess cable, leaving no wires dangling under the desk that might inhibit you from changing positions whenever you feel the urge. 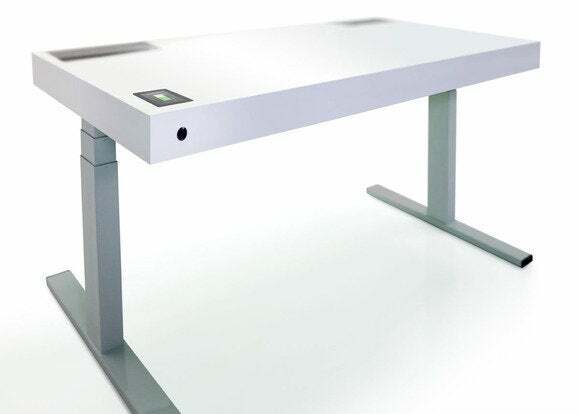 So the desk can tell if you’re standing (or sitting) at it, and at any time, you just double-tap the touchscreen to switch between standing and sitting heights. But if you tend to get engrossed in your work, a button on the front of the desk puts it in Active mode. In this mode, the desk will actually prompt you to change positions—every once in a while, the desk will subtly raise about an inch, then lower back down. No noise (except the quiet hum and vibration of the motor), no light, no annoying beep. 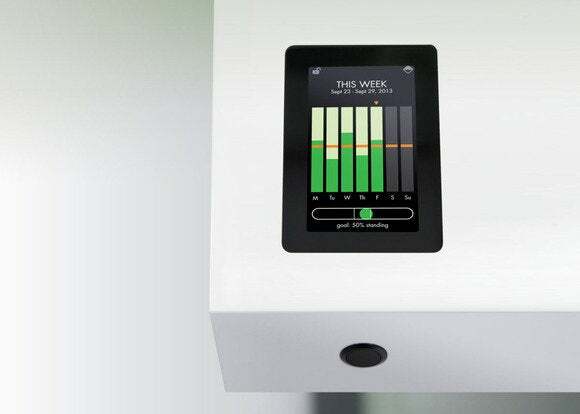 A touchscreen on the Kinetic Desk can display stats that show whether you’re meeting your sit/stand goals. The raise-lower maneuver is timed to a human breath, Labrosse told us, so it should feel calm and peaceful—and easy to ignore if you’re happy to stay where you are. If you want to switch, just reach over and double-tap the screen. Over time the desk learns your preferences, if you like to sit in the mornings or afternoons, and for how long. If you share the desk with someone else, you can each have your own profile with height presets and separate data. The desk lets you set a goal—say, that you’d like to stand at least 50 percent of the time—and change every hour. Charts show your actual stats compared to your goal, and how many calories you’re burning. Obviously, the more you stand, the more you burn. Just a few hours a day can add up quickly. Although it doesn’t talk to your computer or smartphone right now, the Kinetic Desk has Wi-Fi and Bluetooth so Stir can push out updates. In the future, Labrosse explained, Stir would like to integrate with other quantified-self apps. For example, the desk could push out your calorie data to your favorite fitness app, as well as pull in data from other devices, such as a Fitbit. That way, the desk could learn that on days when you run in the morning, you’ll probably want to sit for a few hours. All this intelligence doesn’t come cheap—the Kinetic Desk, handcrafted in Brooklyn and assembled in Nashville, will retail for $3890. Even without the promised integration with the rest of your megatracked life, it’s still a beautiful, well-made standing desk. The sit/stand prompts are helpful, but people who use “dumber” standing desks can easily schedule their own reminders using any number of non-furniture devices. The undeniably cool part is the built-in, effort-free tracking, and how it can learn your preferences over time. Now if it can also make me a perfect cup of coffee that never gets cold and serenade me with Wilco albums all day, it might just be perfect. This story, "Stir's Kinetic Desk prompts you to take a stand" was originally published by TechHive.